Why Look at Potential Connections Between Gypsum and Hydrogen Sulfide? Ten farms were observed during 19 fall and spring agitation events. Portable multi-gas meters (models MX6, M40 and Tango, Industrial Scientific, Pittsburgh, PA) were place around the perimeter of each manure storage, 10 meters downwind of the storage perimeter and attached to the operator for the duration of the event to monitor exposure. Each meter recorded gas measurements every minute during the first hour of manure agitation. Wind speed, wind direction and air temperature were recorded every minute during these events using a weather station (Kestral Communicator model 4500, Nielsen-Kellerman, Birmingham, MI). Manure storage design and manure handling practices were characterized. Manure was characterized according to general chemistry (temperature, pH and oxidation-reduction potential) as well as submitted for a full nutrient analysis content including total nitrogen, sulfur, calcium, percent solids and phosphorus source coefficient. 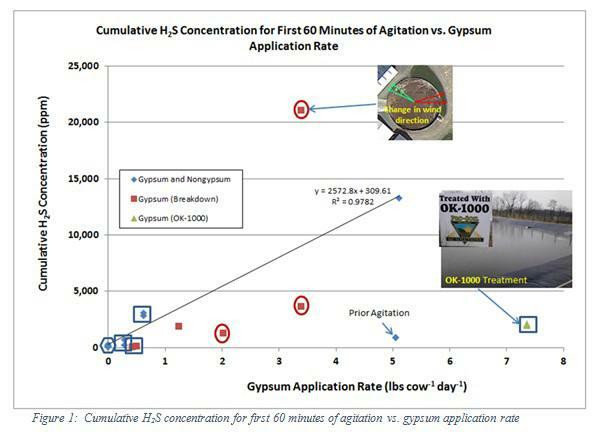 Figure 1 shows cumulative H2S concentrations versus gypsum application rate. Gypsum and non-gypsum farms represented by the diamonds show a significant increase in cumulative H2S concentrations with increasing gypsum application rate. The observations depicted by the squares represent farms that use Vital™ Breakdown (manufactured for Homestead Nutrition, New Holland, PA), a treatment reported to reduce H2S emissions. One of the farms observed, also pointed out in Figure 1 by the triangles, uses OK-1000 (manufactured by Pro-soil Ag Solutions, Hawkins, TX) as a manure additive. Though it appears that these manure additives reduce cumulative H2S concentrations, the reduction was not statistically significant because not enough observations were recorded to provide statistical power. Movement of manure prior to the storage location appears to allow H2S to escape before entering long term storage (shown in Figure 1 as prior agitation), lowering H2S concentrations released during agitation of the manure storage. Wind flowing into proximate buildings inhibited the dissipation of H2S thereby increasing cumulative H2S concentrations as shown by the observation pointed out by the image of wind direction in Figure 1. Four observations of operator exposure (out of 19 observations including non-gypsum, gypsum and gypsum with additive) yielded H2S concentrations above 20 ppm (above the Occupational Health and Safety Administration’s (OSHA) recommended exposure limit. Of the four operators above 20 ppm H2S, three were working over the rim of the storage, which increased risk of exposure. Downwind H2S concentrations above 20 ppm ten meters from storage occurred for eight out of the fourteen observations from farms that use gypsum, showing that children and animals within ten meters of the storage are at risk. Bench scale work will be performed in hopes of finding a manure additive that reduces H2S production from farms that use gypsum. A new product (Dri Mat) formulated from its precursor, VitalTM Breakdown, will be mixed with manure and analyzed to determine the efficacy to reduced H2S emissions. Iron oxide, a by-product of acid mine drainage passive treatment lagoons will be one of the treatments for this work as well. Dr. Eileen E. Fabian, Professor in ABE at PSU, Dr. Herschel A. Elliott, professor in ABE at PSU, Dr. Robin Brandt, Senior Lecturer in ABE at PSU, Dr. C. Alan Rotz, Agricultural Engineer at USDA-ARS and Dr. Ray Bryant, Soil Scientist at USDA-ARS. This project would not have been possible without the support from Natural Resources Conservation Service’ (NRCS) Conservation Innovation Grant (CIG) program, USA Gypsum and Industrial Scientific.